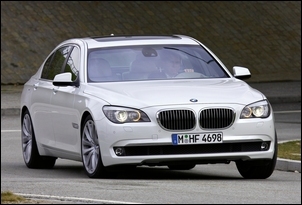 BMW’s new 760i limousine features a new-from-the-ground–up, 6-litre, twin turbo V12 engine. 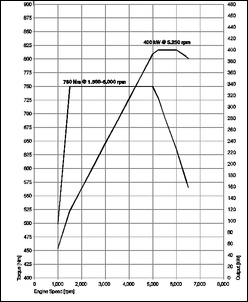 The amazing torque curve can be seen here with peak torque developed from just 1500 rpm. It’s then as flat as a ruler until 5000 rpm! 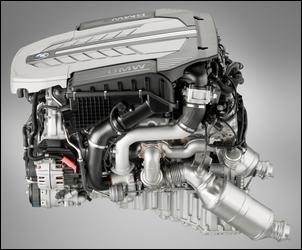 Peak power is at a low 5250 rpm. 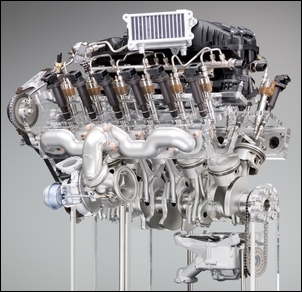 The 60 degree V12 is over-square with a bore of 89mm and a stroke of 80mm. 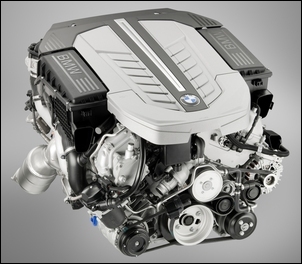 It displaces 5972cc and has a compression ratio of 10:1. Required fuel octane is 91-98 RON. 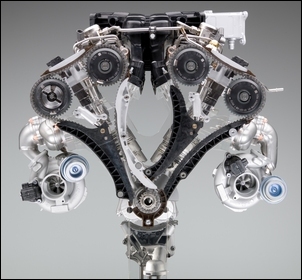 Two turbos are used – one being driven by each cylinder bank. The exhaust manifolds are double wall, two-into-one designs. The cat converters (also double walled) are close-coupled for fast light-off and the mufflers use a variable flow design. A water/air intercooler system (that has what looks to be a surprisingly small core) is used with a dedicated pump and cooling circuit. 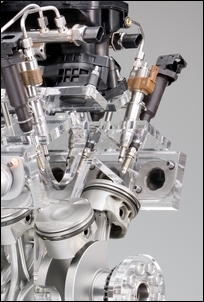 The direct fuel injection system uses piezo design injectors positioned in the middle of the combustion chambers. Fuel is fed to them via stainless steel pipes and injection occurs at 200 Bar pressure. 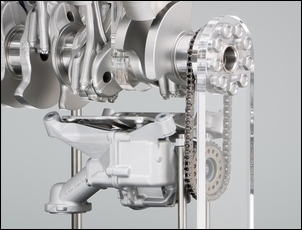 This pressure is generated by single-plunger fuel pumps, one on each cylinder bank, driven by dedicated lobes on the camshafts. The injection occurs in very close proximity to the spark plugs. 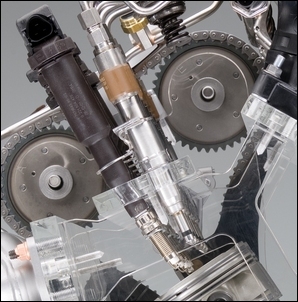 Double VANOS infinitely adjustable valve timing is used on both the exhaust and intake cams. The exhaust valve stems are sodium-filled and have hard chrome plated shafts. The oil pump is a six chamber, pendulum-slide, variable flow design. Monitoring the 10.5 litres of engine oil is a level sensor integrated into the sump, replacing the need for a manual dipstick. An oil level display is provided on the dashboard. The coolant pumps are electric and operate only on demand. 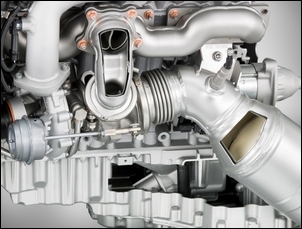 Coolant passages are arranged close to oil passages so that the oil is quickly brought up to – and then maintained at – working temperature. Coolant volume is 15.1 litres. 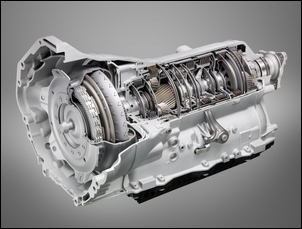 Backing the engine is a newly-designed 8-speed automatic transmission. 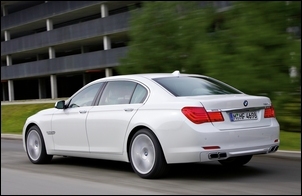 The 2.1 tonne BMW 760i accelerates to 100 km/h in 4.6 seconds, has an EU test cycle fuel consumption of 12.9 litres/100km and CO2 emissions of 299 grams/kilometre.